This Dylan’s Candy Bar gift guide has all of the sweets and treats that you need to satisfy your sweet tooth and candy desires. This Friday Faves list showcases my favorite lifestyle items in one handy gift guide. This gift guide has everything from apparel to coffee mugs and emoji poop! Their online shop is not just about edible confections. They do have a decently sized lifestyle and gifts offering at their store. Heads up guys and gals! Valentine’s Day is approaching us quick. You might just find the perfect Valentine’s Day gift for your sweetheart in this Dylan’s Candy Bar gift guide. Keep reading to find out how you can save at Dylan’s Candy Bar! I have some special coupon codes in this gift-guide! Want to give your morning cup of coffee a colorful, rainbow caffeine kick? Start your morning off on the right food with this Whirly Pop coffee mug. May each sip you take be sweet! Get cozy in this Dylan’s Candy Bar Candy Spill Robe! Now this item here from the Land of Nod is just incredible! Remember the lickable wallpaper in Willy Wonka where the snozzberries taste like snozzberries? This is a scented candy wall decal that is reminiscent of my all-time favorite movie! This is what you get when rainbows and poop collide!! An emoji rainbow poop plush pillow! Seems that these days emojis are all the rage. This one put on a happy face and there is something wrong with you if this does not make you smile. Wink! Wink! This is a sweet, colorful throw blanket from Dylan’s Candy Bar. Wrap yourself up in the sweetness with this fun blanket! :et the world know just how sweet you truly are with this Whirly Pop Choker Necklace. The whirly pop is a common design for Dylan’s Candy Bar’s line of lifestyle items. Smart move on them because I love lollipops and I think that they make the strongest statement about sweetness and candy! There is just something about candy buttons that I love! I have always had a thing for eating candy buttons since I was a little girl. This super soft candy button pillow measures 24″ x 16″ x 4″. Want to give that smile a high-shine in some funky and unique colors? This Unicorn Snot lip-gloss gift set has five different shades of glittery lip balm. You will receive one silver, green, orange, red, and purple lip gloss. This set of lip gloss will bring out your inner unicorn! Treat yourself! You deserve it!! The perfect gift for the artist in your life! Our signature chocolate wheel showcases 56 squares of premium Belgian chocolate in color-coded flavors: Dark Raspberry, S’mores, Milk Toffee Crunch, Hazelnut, Dark Espresso, Almond, Caramel, and Milk. A classic carnival treat with a rainbow twist! Munch away on our Tutti Frutti popcorn but warning: it will always be impossible to ever go back to plain popcorn!! Buttery caramel notes brighten accents of sweet figs in rich dark chocolate. All that glitters is not gold – except our new chocolate bars totally are! Presenting the Dylan’s Candy Bar Gold Collection, a new assortment of luxuriously delicious, high-end Belgian chocolates crafted from only the finest ingredients. Gimme s’more, please! Jumbo fluffy marshmallows are dipped in smooth milk chocolate and coated in crumbled graham cracker for a twist on the classic smores experience. Have your (cup)cake and eat it too! Our delicious NEW cupcake container is filled to the top with decadent Ice Cream Cone Gummy and Cupcake Gummy Bites. It is the ultimate dessert mix for the ultimate sweet lovers! Hot chocolate doesn’t have to be boring. That’s why we’ve got this special unicorn hot chocolate that changes colors when you add hot water. Just pour into a cup and let the magic begin! 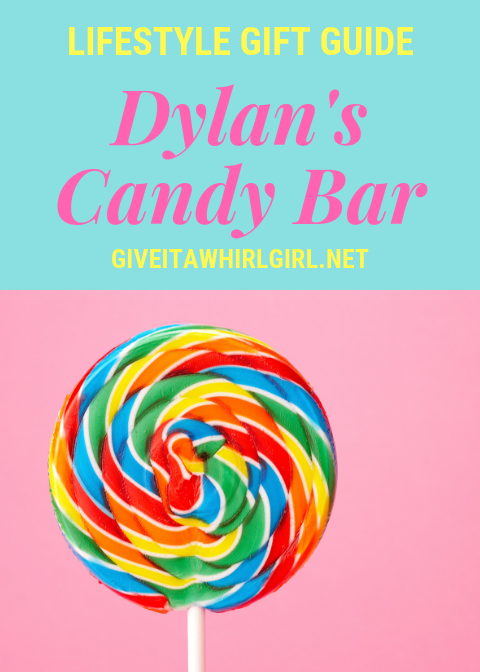 Click the banner below to shop at Dylan’s Candy Bar! Question Time! What lifestyle item from Dylan’s Candy Bar will you be splurging on and treating yourself to? Leave me a comment and let me know. I love to get feedback from my readers! This entry was posted in Friday Faves, Shopping Guide and tagged blanket, candy, candy buttons, coffee mug, coupon, discount, dylan's candy bar, emoji, Friday Faves, gift guide, home, lifestyle, lip gloss, lollipop, mug, pillow, poop, robe, shopping guide, sweet tooth, sweet treat, unicorn snot. Bookmark the permalink.